The tinted moisturiser is a light weight summer alternative to wearing heavy foundation. Most will give the skin an all over even coverage and will keep your thirsty skin well quenched during the summer months. Below are two favourites, one award winning investment piece and one for those whose purse strings are feeling a little tight after booking that summer holiday. This award winning product won an accolade for Best Base Range at the InStyle Best Beauty Buys 2010. It is a lightweight foundation alternative for dry, dehydrated skin. This product is a balm and not a cream, meaning its rich and luxurious texture can blend with ease into the skin and will leave a dewy glowing look perfect for a bright summers day. This product has all the fantastic properties of a high quality moisturiser with Glycerin, Shea Butter and Squalane for intense moisture, Vitamin A and Carrot Extract, which help reduce the appearance of fine lines and Angelica Seed and Chamomile Oil, which soothe and calm skin. Not only that, but it also includes SPF 25 which helps protect skin against damaging UVA and UVB rays and it doubles up as a light foundation. Considering it includes all of the above it is an absolute steal at £32. Apply this to clean and dry skin in the place of a regular moisturiser. Dot a little onto the forehead, cheeks, nose and chin and lightly blend with a foundation brush or your fingers. If your not feeling as flash with the cash then this tinted moisturiser will also do the job, and a very good one at that. 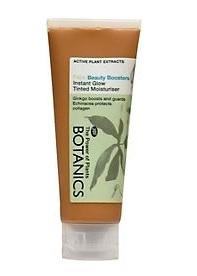 Botanics Instant Glow Tinted Moisturiser is to be applied in the place of a regular moisturiser for a lightweight alternative. It adds light diffusing particles, giving skin a radiant glow whilst also improving elasticity of the skin. 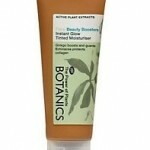 The Botanics range uses combination of carefully balanced active plant extracts. This tinted moisturiser guards the skin from free radicals with Ginko as well as including Echinacea which protects collagen and reduces visible signs of ageing. For £4.49 this product is fantastic, it leaves your skin feeling moisturised with a healthy glow and all without clogging the pores.